The Marine Corps League perpetuates the traditions and spirit of ALL Marines and Navy FMF Corpsmen, who proudly wear or who have worn the eagle, globe and anchor of the Corps. It takes great pride in crediting its founding in 1923 to World War I hero, then Major General Commandant John A. Lejeune. It takes equal pride in its Federal Charter, approved by An Act of the Seventy-Fifth Congress of the United States of America and signed and approved by President Franklin D. Roosevelt on August 4, 1937. The League is the only Federally Chartered Marine Corps related veterans organization in the country. Since its earliest days, the Marine Corps League has enjoyed the support and encouragement of the active duty and Reserve establishments of the U. S. Marine Corps. Today, the League boasts a membership of more than 55,000 men and women, officer and enlisted, active duty, Reserve Marines, honorably discharged Marine Veterans and qualified Navy FMF Corpsmen and is one of the few Veterans Organizations that experiences increases in its membership each year. The Granite State Detachment is headquartered in Manchester, NH, a city with a proud connection to the Iwo Jima flag raising during WWII. 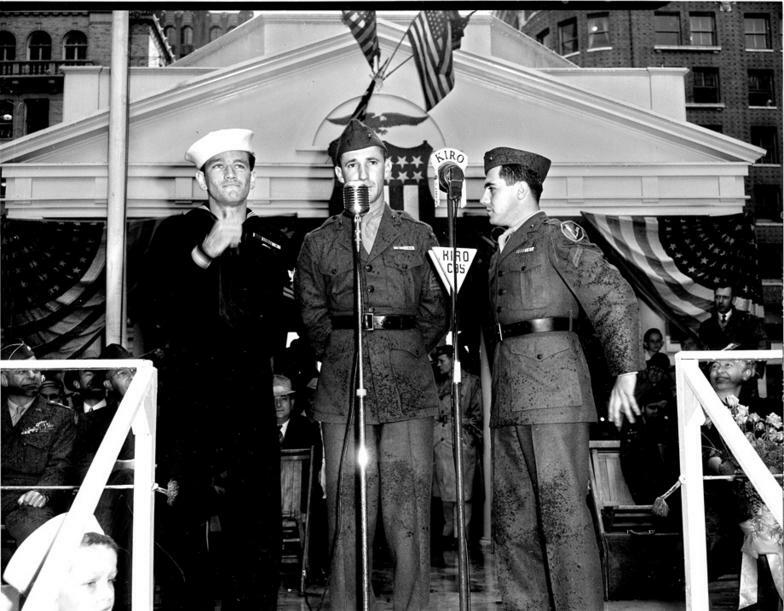 Rene Gagnon, was born in Manchester, N.H. on March 7, 1925 and at 19, the Manchester native became a part of one of our country's most enduring military images: the 1945 flag raising on Mount Suribachi, Iwo Jima. Photographer Joe Rosenthal captured the scene of five young Marines and one Navy corpsman hoisting the Stars and Stripes atop the Pacific volcano in a famous picture. Later, sculptor Felix de Weldon brought the moment to life in the world's largest bronze statue. It stands today in Arlington, Va., as the Marine Corps War Memorial. Dedicated by President Dwight Eisenhower on Nov. 10, 1954, the 179th birthday of the Marine Corps, the sculpture continues to symbolize honor, struggle, victory, and courage to all Americans. On Feb. 23, 1945, Pvt. 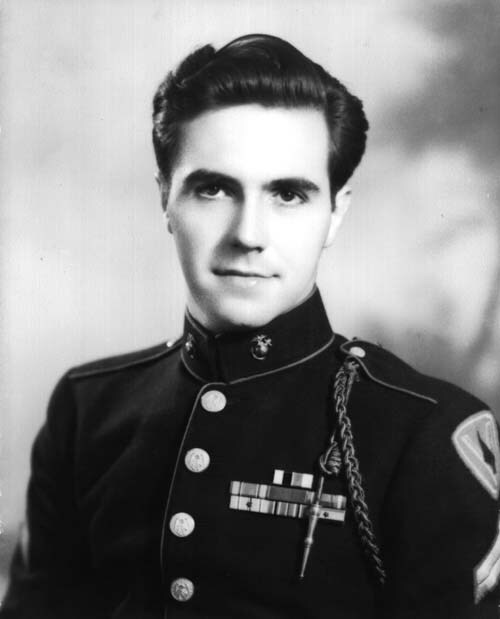 Rene Gagnon was the runner for Easy Co., 2nd Battalion, 28th Marine Regiment, 5th Marine Division, a unit assigned to capture Mount Suribachi when the Marines landed on the Pacific island of Iwo Jima. That morning, a group of Marines had been detailed to raise a flag on the mountaintop. They did so, but battalion commander Lt. Col. Chandler W. Johnson told 2nd Lt. Albert T. Tuttle, his assistant operations officer, to get another flag "large enough that the men at the other end of the island can see it. It will lift their spirits ..."
Tuttle was directed to give the flag to Gagnon, who headed up the hill carrying the 96-by-56-inch set of colors. At the top, four Marines -- Sgt. Michael Strank, Cpl. Harland H. Block, Pfc. Ira Hayes, and Pfc. Franklin R. Sousley -- attempted to raise the large flag, but could not lift it. Pharmacist's Mate 2nd Class John H. Bradley came to their aid, but it wasn't until Gagnon joined in that the six men managed to fly the flag over Iwo Jima. Gagnon, the youngest of the group, died on Oct. 12, 1979, and was interred by waiver in Arlington National Cemetery on July 7, 1981. His fame as a war hero, he once said, was both a blessing and a curse. Although he at first relished the attention, his wife recalled, "He said he just did his job." And a very important job it was. "The raising of that flag on Suribachi means a Marine Corps for the next 500 years," Secretary of the Navy James Forrestal said in 1945.